Although Motorola has not introduced its foldable phone at MWC, the company's VP of Global Product has just confirmed that the upcoming handset — rumored to bring back the legendary RAZR family — has been in development for a long time and will hit the market about the same time as the other such devices that have been recently unveiled by Samsung, Huawei, Xiaomi, and others. While the Samsung Galaxy Fold X and Huawei's Mate X are both official and should hit the market later this year, it seems that Motorola will bring its foldable handset to the market by the end of 2019 as well. The Huawei Mate X also comes with 5G connectivity, while Samsung's foldable does not feature this high-end spec (many people simply have no access to 5G networks yet, so it shouldn't be considered that much of a drawback). However, the Motorola foldable remains a mystery. Last month, the patent for Motorola's RAZR foldable was officially granted. Sadly, the Lenovo-owned brand failed to bring the device to the market as a Verizon-exclusive by the end of February (well, they can do it today, but that's very unlikely to happen). The good part is that Motorola's VP of Global Product, Dan Dery, confirmed that work on the device started "a long time ago" and the company's engineers were able to put this design through "a lot of iteration" so we should expect a thoroughly refined device. 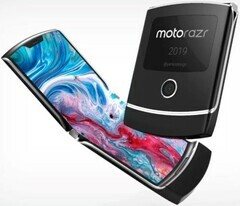 Since the new RAZR missed MWC, now it seems that Motorola will unleash it at the company's annual conference, which is scheduled to take place in August. The name is not official yet, but — according to what most unofficial reports have been claiming recently — we should get ready for a Motorola RAZR 2019 (maybe with an additional name such as "Flex" or "Foldable") with a price tag that reads around US$1,500. If the price mentioned above seems high, you should think about the Galaxy Fold's US$2,000 or the US$2,600 price tag of the Huawei Mate X — none of them is gold-coated, of course. So, are you planning to join the first wave of foldable phone adopters or not? Don't be shy and let us know what you think in the comments section below.